Amazon raised its wages after being pressured. That’s why we need to escalate the pressure! When Bernie Sanders introduced his “Stop BEZOS Act” last month, he was mocked for Not Understanding Basic Economics. His bill required companies to pay back the costs of welfare benefits received by their employees, and was intended to highlight the fact that as Jeff Bezos has become the wealthiest man in the history of humanity, thousands of Amazon workers (in some places, nearly ⅓ of the workforce) have been earning so little that they are on food stamps. However much Sanders insists otherwise, in competitive industries, workers’ pay and benefits tend to match the value of the work they’re doing. Firms cannot “underpay,” or else they risk losing employees to other businesses, while “overpaying” would be financial suicide. …Of course, Sanders is right that wages at major corporations do not always guarantee a decent standard of living, particularly for part-time workers, those with many children, or high rent. But shareholders and customers of companies should not be responsible for every factor of their workers’ lives. Companies pay people for the work they do, and it is unrealistic to expect them to pay people based on the number of children they have, where they live or their medical bills. … My research estimates a program of liberalization in land use planning and zoning laws, child-care regulations, cost-inflating food programs, fuel standards and car dealership laws, tariffs on clothing and footwear and occupational licensing, could directly save poor households anywhere between $830 and $3,500 per year. First, I think it shows you just how limited libertarianism is as an ideology that when the Cato guy tries to suggest alternatives, he says that if you got rid of regulations on child-care, fuel standards, occupational licenses, city planning and zoning laws, then maybe you could save poor families a couple thousand bucks a year. It’s also true that if you let anyone be a doctor, the cost of going to the doctor would plummet! If you stopped requiring cars to be roadworthy, their cost would drop too. There are reasons we do not do these things. Bernie Sanders is not an idiot, and actually knows how to do politics. The theory of economics that the criticisms were based on is balderdash. The criticisms of the “Stop BEZOS” bill are interesting in light of the outcome. I think they show how a lot of people confuse “politics” with “policy”: The bill was not a good policy, therefore it was not good. That’s not necessarily the case though, and I think one of the reasons liberals have failed politically is that they think of politics as “designing the optimal policy” and have no clue how to actually build the political power that allows you to pass and implement the optimal policy. Bernie Sanders does know a thing or two about building political power—that’s why he managed to be the “Amendment King” in the House of Representatives, passing more roll call votes in a Republican Congress than any other member despite being a radical democratic socialist. Sanders’ bill was criticized as a stunt. But that shouldn’t be a criticism, and we on the left need to try more stunts. Trump pulled stunts all the time, things that were mainly for the cameras and which he did to make a point. (Remember Carrier?) Stunts can be extremely effective, and the Stop BEZOS Act was a great one: It effectively drew attention to a real problem, and served as a means of public education. 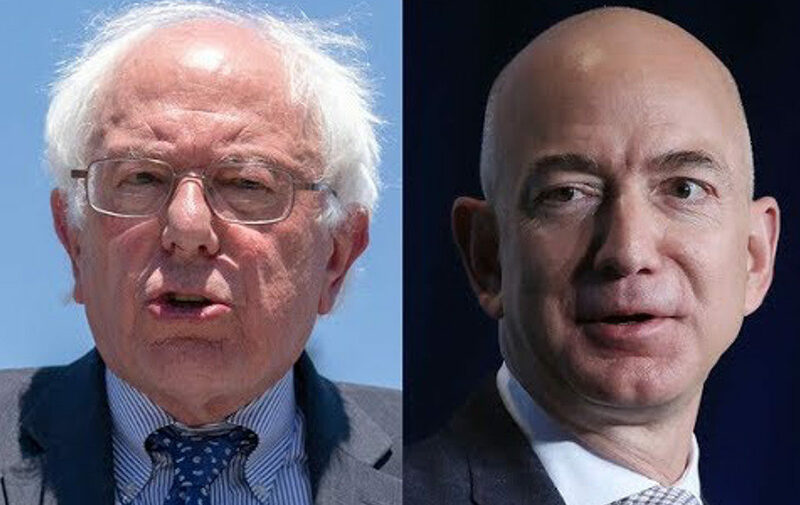 Through the headline “Bernie Sanders Threatens To Make Jeff Bezos Pay For The Food Stamps His Employees Receive,” people find out that Amazon employees are on food stamps. They wouldn’t necessarily have known that otherwise, and even though specifically designing a policy to recoup those benefits might not work in practice, it makes an important point. Plus, it gets the goods! I saw suggestions that instead of trying to recoup these benefits from Amazon, Sanders should advocate raising the minimum wage or expanding the Earned Income Tax Credit. The problem is that Congress is currently controlled by Republicans, so he’s not going to be able to raise the minimum wage. What he can do is shame individual employers like Bezos. And indeed, Bezos listened: Negative publicity caused Amazon to raise its wages. Now, of course, the Amazon raise is not uniformly good news. They also cut some other benefits at the same time, and the higher wages may not apply to contracted temporary workers. And as Alex Press pointed out, the raise does not do anything to alter the balance of power between Bezos and his workers: The real fight needs to be for a unionized workforce. But Amazon is so vast that this is going to do a lot to encourage other employees to raise their wages, too. I remember when the Fight For $15 was first announced, I thought it was madness. $15 seemed so high, it was double the existing minimum wage. Shouldn’t we be pushing for something more moderate? Well, no, it turns out. You should be pushing for what you want, and the Fight For $15 is making a $15 starting wage a reality in many places. The Amazon change also shows how silly the theory that “companies pay employees the value of their labor” is. Clearly they don’t, since Amazon was just able to raise wages across the company under pressure. The Cato writer said that it would be “financial suicide” for a company to “overpay,” but I doubt Amazon is committing financial suicide here. Bosses—and the intellectuals who justify everything bosses do—always say they can’t afford to pay more, whether it’s true or not. Sometimes it is true. At Amazon, it’s definitely not. If Bernie had listened to Mr. Economics 101, Amazon workers might well be making less money. I shouldn’t imply that Bernie Sanders was singlehandedly responsible for this, actually. Quite the opposite: The reason Amazon picked $15 is because the workers in the Fight For $15 movement have put in so much effort making the seemingly impossible a reality. But I do think Bernie deserves credit for understanding how politics works: It’s about power. Who has it, and who doesn’t. If Bezos sees a potential regulatory threat and a public embarrassment, then he will make concessions that he otherwise would not have. It’s up to us to exert the pressure that produces the results. What Amazon’s raise shows is that shaming corporations and billionaires is not just morally correct but practically useful, and we should continue to escalate it.